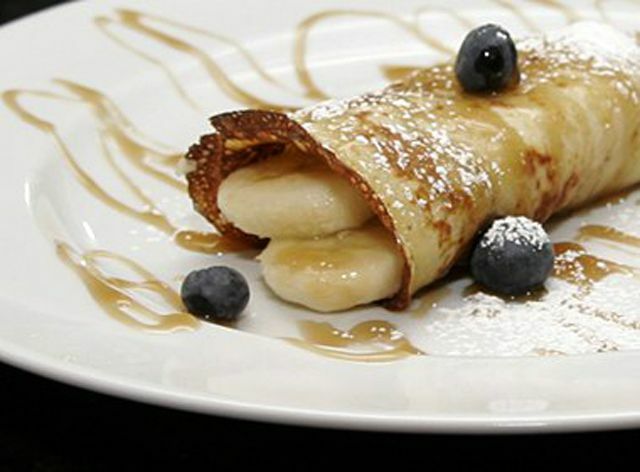 Garnish these delicious banana crepes with the brown sugar rum sauce and a few pecans, berries, or more slices of banana and a sprinkling of cinnamon sugar. The crepes would make a fabulous holiday brunch dish. Make a batch for a New Year's morning brunch or Valentine's Day breakfast. In a blender, blend eggs with milk. Add the flour, melted butter, and 2 tablespoons sugar, salt, cinnamon, and 1 teaspoon vanilla. Blend until smooth. Pour into a container, cover, and refrigerate let stand for 1 hour or refrigerate for up to 12 hours. To cook, heat a lightly buttered 7-inch or 8-inch crepe pan. Pour about 1/4 cup of batter into the hot pan and swirl the pan so the batter coats the bottom of the pan. Cook until the edges begin to brown. Carefully lift with a thin spatula and flip over. Cook for a few seconds, just until lightly browned. Reduce heat and simmer for 2 minutes. The mixture will foam, so be careful it doesn't boil over. Roll the crepe up and place it on a serving plate. If desired, sprinkle with a few berries, extra slices of banana, or pecans. Drizzle the crepe with more rum sauce and sprinkle with powdered sugar. Repeat with remaining crepes, bananas, and sauce. If you will be storing the crepes for a short time before you assemble them, separate the crepes with small squares of waxed paper.